ALLEA Board Members convened at the Hungarian Academy of Sciences in Budapest on 3 September 2017 and started preparations for the upcoming transition of the ALLEA Presidency. 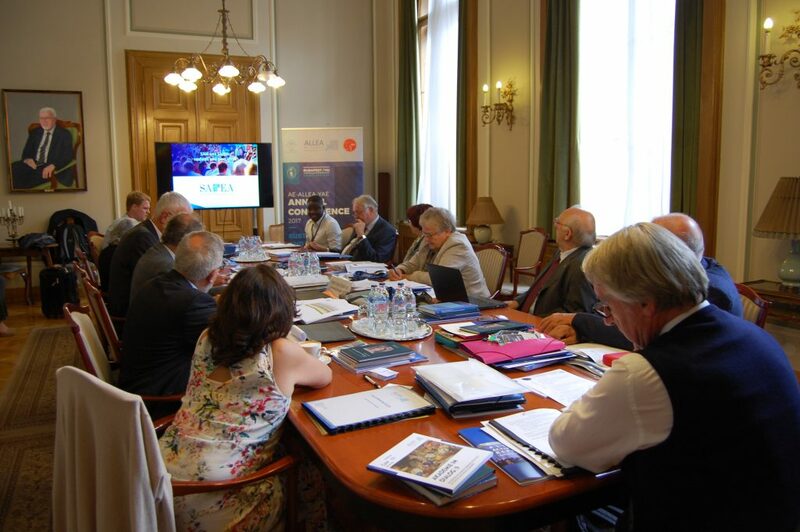 ALLEA Board during their discussions in Budapest at the Hungarian Academy of Sciences on 3 September 2017. The ALLEA Board Members met on 3 September 2017 at the Hungarian Academy of Sciences in Budapest. Participants discussed the next steps for ALLEA, including upcoming publications, working group and SAPEA activities, and the first steps of the new working group “Trust, Truth and Expertise”. The participants also assessed next actions in preparation of the Presidency transition, which will take place during the next General Assembly in Sofia in May 2018. During the transition, six of the current Board Members will conclude their term. The ALLEA Secretariat already sent a call for nominations to Member Academies asking for proposals of Academy Fellows to renew the Board. ALLEA delegates will vote on the candidates at the General Assembly in Sofia in May 2018.